The National Park Service website for Yosemite, www.nps.gov/yos, is a very thorough resource. In addition to a wealth of information about the Park and advice for planning your visit, this web site is your go-to spot for the most current updates on changing conditions in the park. If summiting Half Dome is on your wish list, go here for the latest information on Half Dome permits and other helpful input. 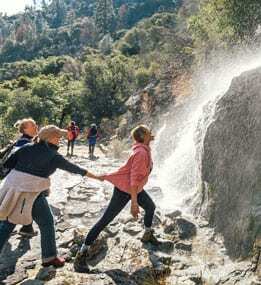 Keep in mind that Rush Creek Lodge is at an elevation that is 600 feet higher than the Yosemite Valley, so the temperature tends to be a few degrees cooler at the lodge. If you are traveling in the winter, be sure to see the section of our web site regarding Winter, and Winter Driving Information.